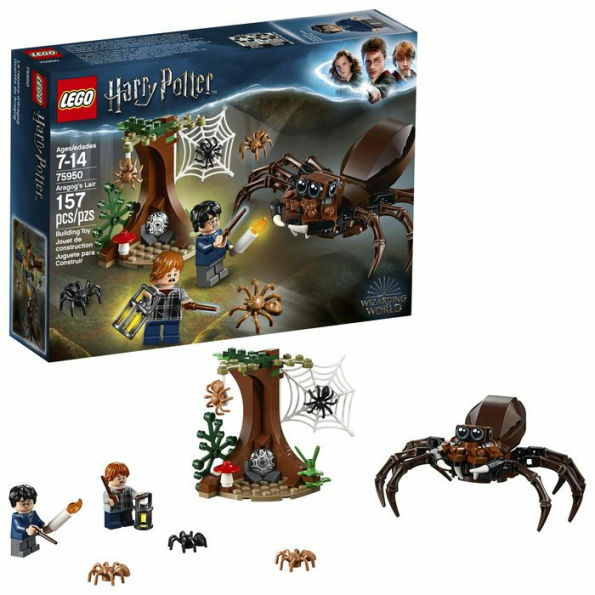 Who dares enter LEGO Harry Potter 75950 Aragog's Lair? Help Harry and Ron escape the giant spider and his army of offspring in the Forbidden Forest. Use your magic wands and lantern to fend off the colony of spiders, flying cobweb and Aragog’s fearsome fangs-then escape the creepy hollow! Includes Harry Potter and Ron Weasley minifigures. 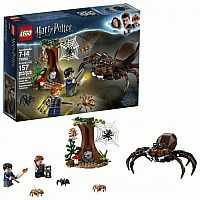 Features a buildable Aragog spider and tree. Aragog has 8 posable legs and 2 movable fangs. Tree has a spiderweb shooting function, attached spiderweb and a buildable red and white mushroom. Fire the tree's spiderweb shooter to trap Ron and Harry! Accessory elements include 2 wands, a lantern, candle, spiderweb and 5 spiders. Tree measures over 3” (8cm) high, 2 in (7cm) wide and 1 in (5cm) deep. Aragog measures over 1 in (4cm) high, 4 in (11cm) long and 4in (11cm) wide.